How safe is the area you’re travelling to? While many countries recognise the rights of lesbian, gay, bisexual and transgender (LGBT) travellers, this is by no means universal. Attitudes to LGBT people vary enormously depending on where you are. In seven countries around the globe homosexuality is still punishable by death and a further 70 countries actively imprison people because of their sexual orientation. 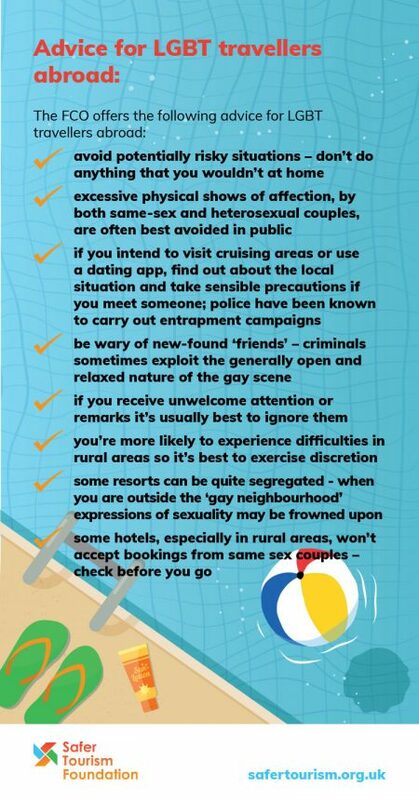 So if you’re a LGBT traveller it’s important to thoroughly research the area you’re visiting so you know what the local laws and customs are there. The Foreign & Commonwealth Office (FCO) travel advice website has information on 225 territories around the world. As well as general safety information it includes a section on local laws and customs which will tell you if LGBT travellers are likely to face any issues in a particular country. The International Lesbian, Gay, Bisexual, Trans and Intersex Association’s website also has a world map which highlights potentially dangerous regions and countries for gay people and has details of their rights around the world. There are several other useful sources of information. For example, there are guide books aimed at LGBT travellers, the gay press and local LGBT organisations in the country you’re travelling to often can offer advice on local laws and attitudes. Your tour operator or travel agent might have an idea about the local LGBT scene (particularly in popular resorts) and the local British Embassy where you’re planning to stay can also offer advice. If you do experience problems when you’re abroad you can either contact the local police, depending on where you are, or your nearest British Embassy, commission or consulate can help. As well as those mentioned above, other useful websites include the International Gay and Lesbian Travel Association which organises tours for LGBT travellers and the Gay European Tourism Association has travel advice for LGBT people travelling in Europe. If you would like to keep up to date with the work we are doing, please enter your email address below to subscribe to our newsletter.